Why do forks and spades break? 1. The tool wasn't built for heavy use. 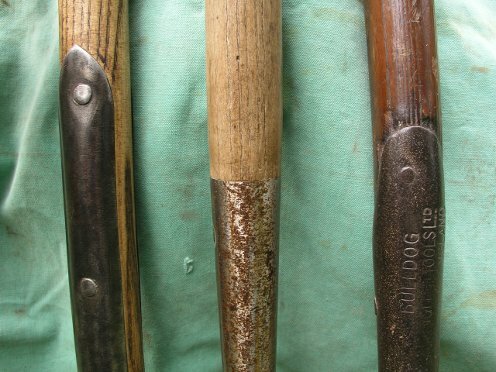 At one time you could buy border forks/spades for light duty in cultivated soil (weeding, light cultivation), and stronger digging forks/spades for heavy work (transplanting, compacted soil, digging out roots etc.). Using a light border fork to dig out a mature shrub usually ends with breakage. Use the right tool! 2. The handle is rotten. Tools shouldn't be left out in the weather, as sun and rain eventually weaken the wood. Occasional application of lineed oil on handles helps to keep them in good condition. 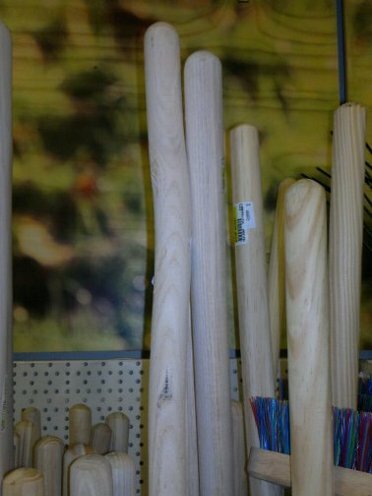 I have also seen modern handles where bad grain or faulty wood (splits, knots, warping) virtually ensure breakage, like the replacement handle shown below, offered for sale at a "Country Store". 3. The tool was badly made and is unfit for purpose. On the left is an old "strapped" tool, having straps on the front and back, with a series of rivets attaching them. This is a very strong design. The whole assembly can flex a little without breaking. The rivets run in the direction that force is applied, and don't weaken the handle unnecessarily. Stresses are diffused. This was the favourite design for tools for professional or heavy use i.e. navvies, nurserymen, foresters. In the middle is a "socketed" tool, the type commonly found on newer tools. The socket ends abruptly, concentrating stress in one area. Unfortunately the wood is also cut into (and therefore thinned down) so the socket and handle join smoothly; this interupts the grain of the wood and is often where a split starts. To make matters worse there is a single rivet slightly below the top of the socket, running left to right. This almost guarantees that the handle will break in this area if the tool gets heavy use. On the right is a further variation, socketed but with a short extension strap above the socket, and two rivets, one running left to right in the socket, and one front to back near the top of the strap. This is a good modification of the socket, giving extra strength with minimum added weight, and is great for moderate domestic use. If you want a really stong tool for heavy use search out a strapped one. To enquire about strapped tools for sale contact me.